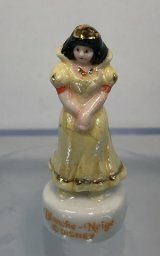 Porcelain shoulderhead lady with elaborate wig of curls in the back. (Click to see back.) 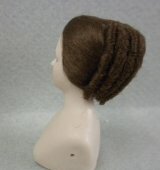 She has small holes on the sides of her shoulders where her full length arms can be strung on. 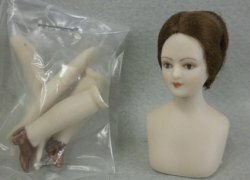 Also included are half length porcelain legs with painted shoes, and a pattern with instructions for her body. She is marked Mary 1981 on her back.